This wide angle solar garden spot light has an detached solar panel which is a great option in solar lighting for get the optimum sun exposure. They give you 3 different ways to install this solar spot light. A stake is supplied for in the ground installation, if you remove the stake the base itself can be attached to a deck or a wall. Customers who have already purchased this light have used it for marking driveway entrances, barns, sheds, trees, flag poles and highlight garden features. The fixture itself is made out of anodized aluminum which is seamless and water tight. Much better than many of the solar spot lights that are made out of plastic. The solar panel is 5 inches wide by 7 inches long. All of the circuity is soldered by hand and each solar spotlight is tested at the factory before it shipped. The solar panel has an on-off switch, when left in the on position, this will give you dusk to dawn operation. A full day's charge on the solar panel should let the spotlight on for up to 12 hours. The solar panel includes three NiMH batteries and the spotlight has 16 LED bulbs. This solar garden spot light produces a bluish hue color which is typical of LED's. It would be nice if the cord from the solar panel to the light was longer. The cost of the light is a little expensive at 99.95. 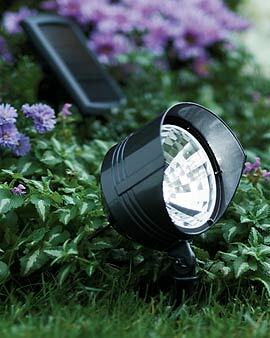 Overall, this solar garden spot light rates as one of the best solar lights we have reviewed. Other than the common complaint of solar lighting not being bright enough. Very few customers complained about the price, after they had bought and used them. Many customers have came back and purchased more lights because the quality and illumination of the light.